I have an addiction to Pinterest. There. I said it. I love it and I can't get enough of it. I will be satisfied to browse for half an hour without any luck if I just find one good idea. 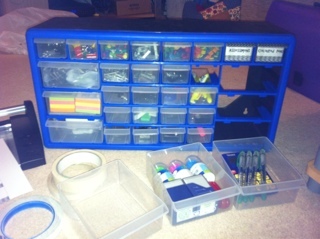 In the few months that I've had a Pinterest account, something has caught my eye again and again: the beautiful Teacher Toolboxes that people create and post. 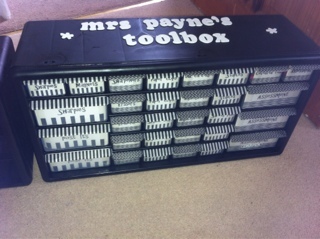 So, having created a board full of Toolboxes I liked, I was inspired enough to create one myself. 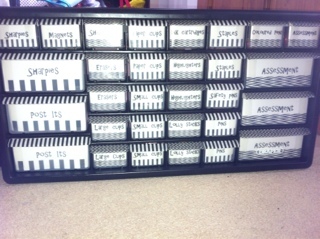 Again inspired by Pinterest, I have chosen a black and white theme for my room, so I followed this when creating my Toolbox. 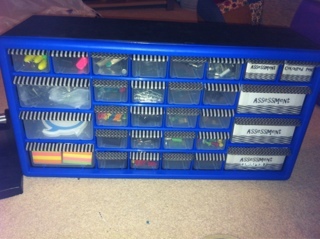 A tool accessory box, mine is this one from Amazon. Some washi tape, like this. Some double sided sticky tape. 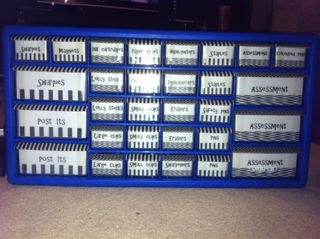 Lots of stationary items to fill the toolbox with. Spray paint that can go on plastic, I used Direct To Plastic. A large area and lots of time, preferably with movies or a TV series, I chose One Tree Hill. I collected my pieces and was ready to go. 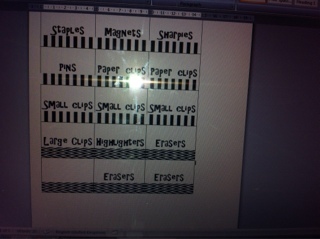 First, choose a colour scheme that matches your washi tape then load up your laptop and create a table in word. I measured the fronts of each drawer and made the boxes of the table the same size (right click, table properties, adjust row width and column height). Then insert your words and a pattern image to the box of the table. The next job is to put the patterned tape on the handles of the drawer. This is an easy job, just cut it, place it on, secure it down and tuck in the edges, like wrapping a present. Hopefully you'll see that things are coming together! Next job: back to labels. This is where the double sided sticky tape comes into its own. 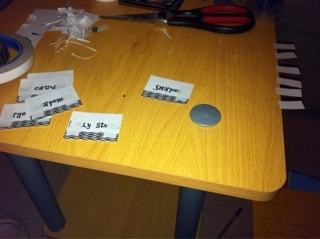 Cut tiny bits and attach one bit on each side of the front of each label, peel the backing off and you're good to go. Stick it to the inside of the drawer and, voila! 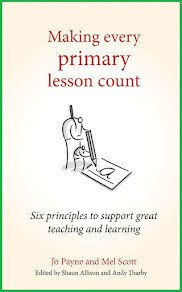 Once you've done all your drawers, you're almost there. The final job is to remove all the trays and spray paint the frames. Unfortunately my spray paint hasn't arrived yet so that job will have to wait! UPDATE: The boxes have been spray painted and I added some white sponge letters like these to the top. 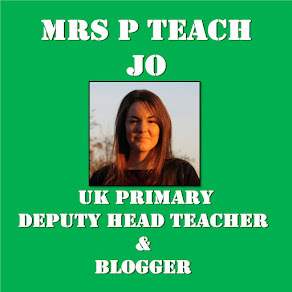 I hope this helps those wanting to make one of these, particularly if you're in the UK as I couldn't find any information online about where to buy things! Let me know if you try one of these, I'd love to see how it turned out!